I miss keeping this Web log and I keep trying to pick it back up. Today I thought of it especially because I returned to an experience I used to get a big kick out of chronicling. It remains an exotic experience. Perhaps it will always be so, seeing that I fell off the Confession wagon and had to go back after a million years -- an unforgettable experience. Anyway, I always try my best to be conscious of every minute of it, not to go through it on autopilot. And happily circumstances usually conspire to make every Confession a Confession to remember. Today what happened was, I was in St. Michael's, as usual. My friend Meghan and I stopped in there for prayer and Adoration before we went sketching. And Confessions were going on. And the line was not long. I watched and waited, as I always do. I could go to confession on a daily basis and I could still not get the system right. When the light is off over the booth, you may enter, and kneel, and await the priest's attention, right? Or is it when the light is on? In this case I saw the light was off, and a gentlemen walked into the booth, and the curtain closed behind him, and the light went on. Bingo! That meant when the light is off nobody is in there. The light on the other side of that Confession station was off. I made my way over there. I pulled back the curtain, gingerly because I will never forget that time I walked in on that one girl. Nobody was inside. I went in and knelt down. Holy cow, I could see the priest sitting there on the other side of the screen! I never remember seeing that before. I think a light was on that was supposed to be off. Either that or ... had I made a mistake? Was I not supposed to go in there? Things quickly got worse. That gentleman who had walked in before me, I could hear every word he was saying! I could hear the entire conversation between him and the priest. Do not get all excited here -- all I heard was the priest giving him some kind of advice, but still, sort of intimate, you know? I knelt there confused. Do I stay or do I go? Thank God the priest invited him to recite his Act of Contrition. That is when you know you are out of the woods. But the whole time this gentleman, this young man, recited his Act of Contrition, I was kneeling on pins and needles. Clearly I was not supposed to be here, where I was. I worried I would be reprimanded. The confession ended without incident. But my problems continued. Usually your cue to start your confession is when the priest's window slides open. The window was apparently already open. End result, as we say here in Buffalo, there was a protracted silence with this white-haired Jesuit in the window just sitting there, and me just kneeling there. Finally he said, "God bless you." As I had not sneezed, I took that as my cue. 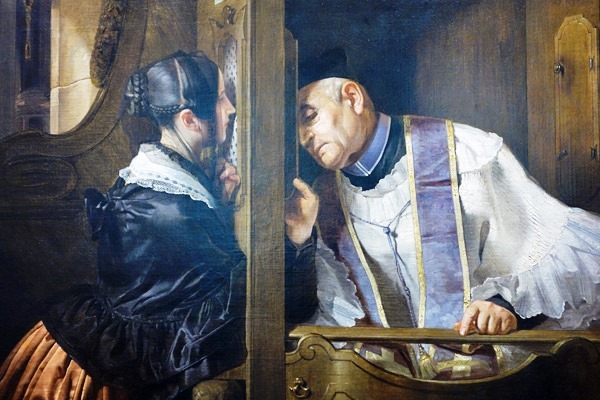 What is it about confession?